Presidents are only human, so they make mistakes. No, I’m not talking about Donald Trump’s claim that he only hires the “best people”, or George Bush’s decision to invade the wrong country after 9/11. I’m talking about John Kennedy, and how he misread history, unintentionally insulted the Commonwealth of Virginia, and was compelled to make amends. The story begins on Wednesday December 4, 1619. That’s the day 38 English settlers from the London Company, navigated their ship down the James River and onto Berkeley Hundred (Harrison’s Landing), in what is now Charles City, Virginia, just 20 miles upstream from Jamestown, which had been settled twelve years prior. The landing party was led by Captain John Woodlief, who, as prescribed in the company charter, ordered a day of Thanksgiving to be observed upon their arrival, and every December 4th thereafter. Over time, Berkeley became known for its historic firsts. The first bourbon whiskey was made there in 1621 (by a preacher no less). “Taps” was played for the first time while the Union army was encamped at Berkeley in 1862. And, of course, it was the site of America’s first Thanksgiving. More on that in a moment. In 1907 Berkeley was purchased by John Jamieson who had served as a Union drummer boy during the army’s encampment at the plantation. Ownership later fell to his son (and my friend) Malcolm, who passed away in 1997. Mac loved Berkeley and was aggressive in marketing the historic site, including through the use of promotional videos and commercials which I helped to produce. He invited the public to tour the house and grounds, sold Berkeley boxwoods and bourbon, and held an annual Thanksgiving pageant which attracted tourists from across the country. But the celebration wasn’t always widely recognized. One hundred years after his father beat the Yankee drums at Berkeley, Mac was upset by something another Yankee did. In the fall of 1962, President Kennedy issued his yearly Thanksgiving Proclamation in which he recognized his home state of Massachusetts as the site of America’s first Thanksgiving. And so, on November 9th of that year, Virginia State Senator John Wicker was prompted by Mac to write to the President, and point out Kennedy’s faux pas. In his telegram, Wicker referenced historical records about Berkeley’s celebration, which took place one full year before the Pilgrims landed at Plymouth in 1620. 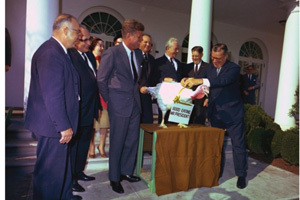 The following year, on November 5, 1963, President Kennedy had to eat crow during his annual Thanksgiving proclamation, saying, “Over three centuries ago, our forefathers in Virginia AND Massachusetts, far from home, in a lonely wilderness, set aside a day of thanksgiving.” Kennedy’s New England bias wouldn’t allow him to disavow Plymouth entirely, but Mac was happy that Berkeley finally gained official recognition for holding the first Thanksgiving, even if it was a shared honor. Sadly, it was to be Kennedy’s last proclamation. He was assassinated seventeen days later in Dallas. The holiday season is now upon us, and it’s a time for celebrating with friends and family, and for remembering fondly those who are no longer with us. And in this season of giving thanks, perhaps we would all do well to emulate those weary English settlers, and just be thankful for surviving another day of our long journey. So here’s a Berkeley bourbon toast to Captain Woodlief, a little drummer boy, old Mac, and to that Yankee president who finally set the record straight. Happy Thanksgiving!